The “Original” Corky’s of Hartford, CT. is now in Arlington, TX. So if you're one of the many people who tell me they have been searching for something other than Fast-Food" Pizza Chains, then you owe it to yourself to at least stop by and try Corky's. We strongly believe in maintaining the integrity of True Italian Neapolitan Pizza just as it began in the 1800's in Naples, Italy... "Wood-Fired" Brick Oven Baked Directly on the Deck of an Open Hearth in plain sight... being able to see your pizza bubble and bake while it's happening. We are committed to Old World Quality and our Family's Tradition. It's been said, this family tradition originated over a century ago in Bari, Italy where my father's family is from. Now the legacy continues in Arlington, Texas. Also don't forget to add our email address to your address book to insure you will receive our email VIP Specials. Our dough is hand stretched to order, then placed on an old fashioned wood "bakers peel", which is lightly sprinkled with savory crunchy semolina corn meal. 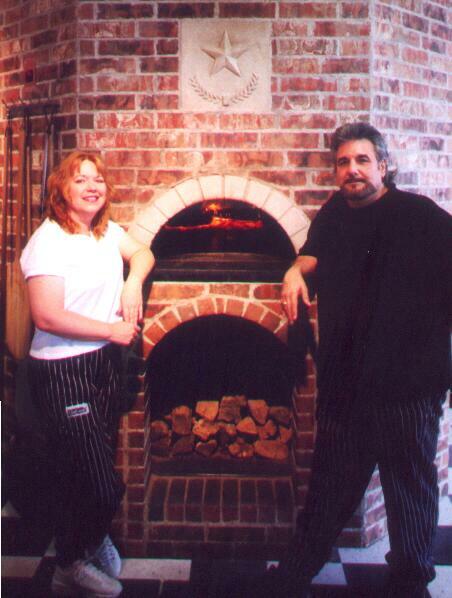 Then baked ”DIRECTLY ON THE OPEN HEARTH”, IN OUR AUTHENTIC OLD WORLD WOOD-FIRED BRICK OVEN! Corky’s Famous Pizza Sauce is another Old World Family Tradition. Our pizza sauce is made from scratch using plump and juicy imported select plum tomatoes, which are blended and prepared on the premises, using garden fresh ingredients in a time-tested family recipe for over 73 years... producing a light “Old World” flavor. Custom-Built Old World Wood-Fired Brick Oven. We do not use canned peppers, or plain raw peppers. Fresh peppers are washed, hand cut, and seasoned Corky’s special way. Then they are roasted to perfection in our Old World Brick Oven. We do not use canned mushrooms. We use only Select Fresh Sliced Mushrooms. This new location in Arlington, Texas opened on July 18, 2002. We accept Cash, MC OR VISA For payment... Sorry, we don't acccept checks. We don't serve beer or wine at this time, however you may BYOB. On Friday, September 27, 2002 the Fort Worth Star Telegram published a very nice article that Steve McLinden wrote about Corky's. Thank You Steve and Thank You Arlington for all of your support and positive feedback. We all appreciate it very much. On Wednesday, October 23, 2002 the Star Telegram published another wonderful article written by Bud Kennedy. Bud began his piece by saying, "Pizza lover's brace youselves for what just might be the best pizza in North Texas!" Bud Kennedy wrote another article on Friday January 3, 2003 entitled, "Resolve to eat well this year - Restaurants you must try in 2003." Bud said, "Corky's Famous Old World Pizzeria, 4760 Little Road Arlington, serves the best thin crust pizza I've ever found in Texas!" Thanks again Bud! Your positive words are very much appreciated. Michele and I look forward to you, your family and friends stopping by to "break bread" with us at Corky's. After all, there's nothing more important than family and friends. When you come in to Corky's, please be sure to introduce yourself to Michele and me. I truly do believe that "Strangers are merely Friends that we haven't met yet". 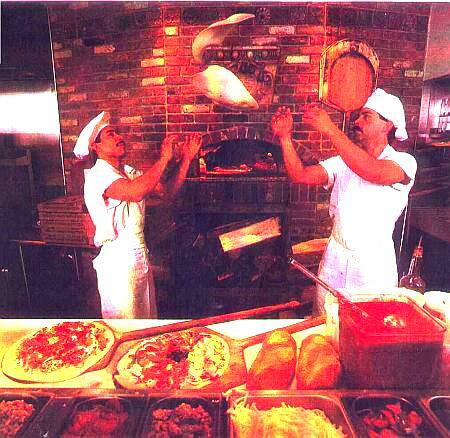 Come on in and experience the "Old World Wood-Fired Brick Oven" Tradition! Also, click on the "CORKY'S MENU" link below to look over our menu and/or download a PDF copy to print or save.